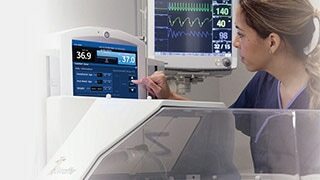 The Giraffe Stand-alone Infant Resuscitation System allows you to bring life-saving capabilities virtually anywhere in the hospital, from Labor and Delivery to NICU to the well-baby nursery - and gives you fast, easy, integrated access to critical equipment you need for safe, effective resuscitation of newborns. A built-in pressure-priority valve insures the system - when connected to both wall and tank gas sources - draws from the wall first, thereby conserving tank gases for transportation. Full integration of critical resuscitation features makes set-up easy and keeps the care area organized. And, it simplifies standardization of resuscitation protocols across the perinatal care area. The streamlined design puts all the therapy right at your fingertips, giving you convenient and unobstructed access to suction, blended gases, and monitored positive pressure capability. Flexible mounting options, from roll stand to GCX arms, let you use it alongside any warmer, incubator, or hybrid bed in your facility. It's designed to easily mount on the Giraffe* Shuttle,1 giving you quick access to essential resuscitation equipment when moving the baby within the hospital. Innovative T-piece circuit promotes ergonomically comfortable hand-positioning and single-handed control of breathing. Built-in pressure-priority valve insures the system - when connected to both wall and tank gas sources - first draws from the wall, conserving tank gases for transportation. 1. An intra-hospital transportable power source that is an accessory to Giraffe* and Panda* beds. A venturi vacuum supplies continuous suction range from 0 to 150 mm Hg (0-20 kPa) as per local resuscitation protocol for clearing of the oral, tracheal and nasal passages. Suction control knob lets you adjust desired negative pressure. Conveniently located for viewing. Displays both the PIP (Peak Inspiratory Pressure) and PEEP (Positive End Expiratory Pressure). The Peak Inspiratory Pressure (PIP) control knob and a flow meter regulate medical gas supplied to a dedicated T-piece outlet. Eliminates the need for an external system and additional tubing. Regulate FiO2 from 21 to 100% oxygen with the control knob located on the front panel. Primary flow meter and control knob let you set desired flow rate. A secondary flow meter outlet and control knob for free flowing oxygen blow-by. Primary gas outlet port to connect GE’s T-piece circuit. Auxiliary gas outlet port to connect Oxygen tubing for blended free flow Oxygen. Allows a trained clinician to monitor pressure throughout the respiratory cycle. Primary gas outlet port to connect either a self-inflating or flow-inflating bag. Auxiliary gas outlet port to connect Oxygen tubing for blended free flow Oxygen. Built-in gas fittings and adapters for Air and Oxygen gas inputs from wall sources. Suction port to attach one end of the suction tubing. Connect other end to the vacuum inlet port on the suction canister provided with the unit. Built-in gas fittings and adapters for Air and Oxygen gas input from the tank source.